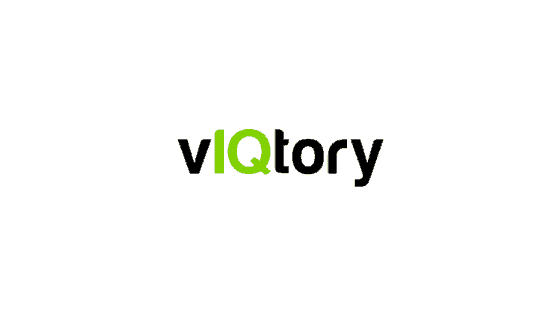 vIQtory is a football education resource to help you learn football. 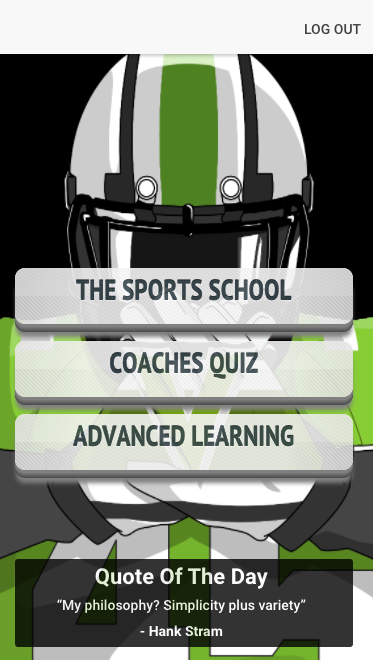 Whether you’re new to football or have been around it your whole life, we encourage you to never stop learning! How do we teach football? New content is always being released on the blog. We have short blog posts and comprehensive articles, as well as video and audio content updated constantly. Whether you are trying to learn football, or trying to expand your wealth of football knowledge, you will always find content that interests you on the blog. 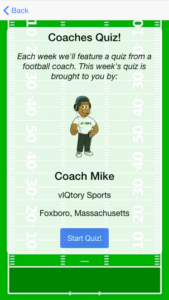 Our shorter posts are great for learning quick facts about the sport and its history or to find the answer to that one football question that has been bothering you for weeks. Our longer posts are designed to teach you a concept, and then teach you everything you could possibly want to know about that topic in a way that is easy to follow and understand. If you want to learn football, be sure to check out the Blog before you waste your time looking anywhere else. 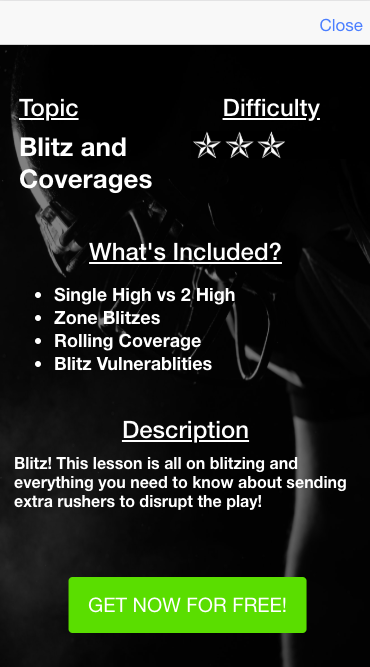 – The fun stuff – We have access to past NFL players, NFL Hall-of-Famers, coaches and current players, which enables us to provide valuable insight into the game that you wont find anywhere else. – An expansive collection of football drills guaranteed to improve any athletes performance on the field. If you are a coach or a player, these drills can change your season. What better way is there to learn than to hear it directly from the people who have already done it? 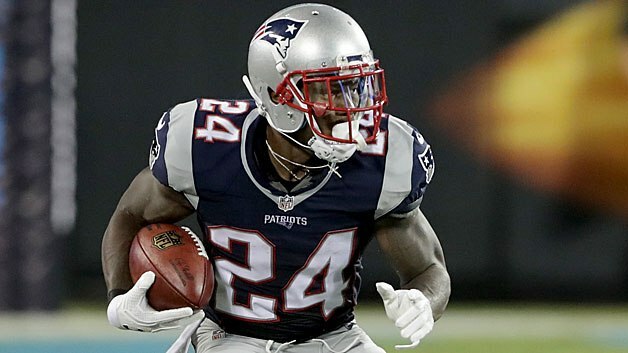 Each week we produce a podcast that typically features current and former NFL players. We also have on coaches and other professionals whose careers are closely related to sports. Our podcasts have quickly grown into a major part of how we tackle understanding the mental part of football. Learning how to approach the game by listening to how some of the best football players in the world did it, provides insights that go beyond what we can write about in a blog. We also keep the podcasts relatively short and packed with information so that they can be listened to fairly quickly without wasting any of your time. Lastly, we love feedback! Be sure to comment on our podcasts with any thoughts or questions that you have. And, if you enjoy them, subscribe and share them to the people you think will also enjoy them! Not sure where to start learning football? Let us guide you! Meet Coach Hank and Coach Mike! Our sports school starts with the most basic of concepts (equipment) and walks you through the advanced concepts (coverages/route running). Each level that you progress, we increase with difficulty. Our sports school is split up into a two part system: References and Questions. References are the main point of focus on how we teach football. Our focus is educating the user both through text and visually. We understand both kids and parents learn differently and we try to appease all learning styles. Users are able to cycle through (forward and back) the references that apply to that lesson. As much as we want to challenge the user in the question section, we want to ensure that users fully understand the concepts we’re trying to teach… which leads us to our questions section! Let’s challenge your brain! We’ve shown you 6-10 references – now let’s see how well you’ve absorbed the information. We’ve created custom questions for each quiz. After each question we give you a right or wrong answer popup, along with the explanation of why you got the answer right or wrong. 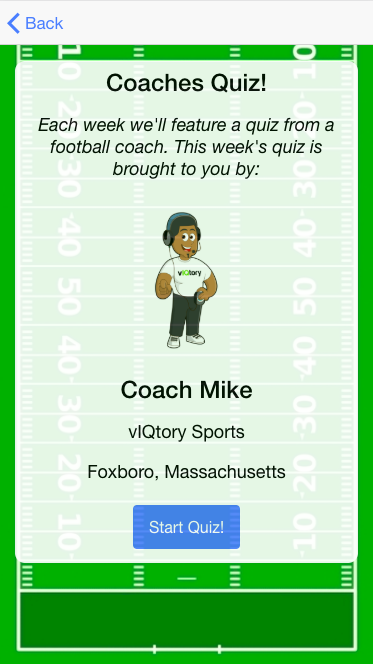 Our coaches quiz features a new quiz from either Coach Mike or one of many featured high school, youth or college coaches. Our quizzes are often 5-10 questions long and feature strictly questions (no references). Think you can beat our coaches? Let’s find out! We understand that everyone who wants to learn football isn’t a novice. There are many great youth, high school, and college coaches around the world who have helped build a solid mental foundation for many players. We’re looking to enhance and build off that foundation. Our Advanced Learning section includes various college level and professional level insights on positions, techniques, and deeper insights into the game. The format of the advanced learning is reference-questions! 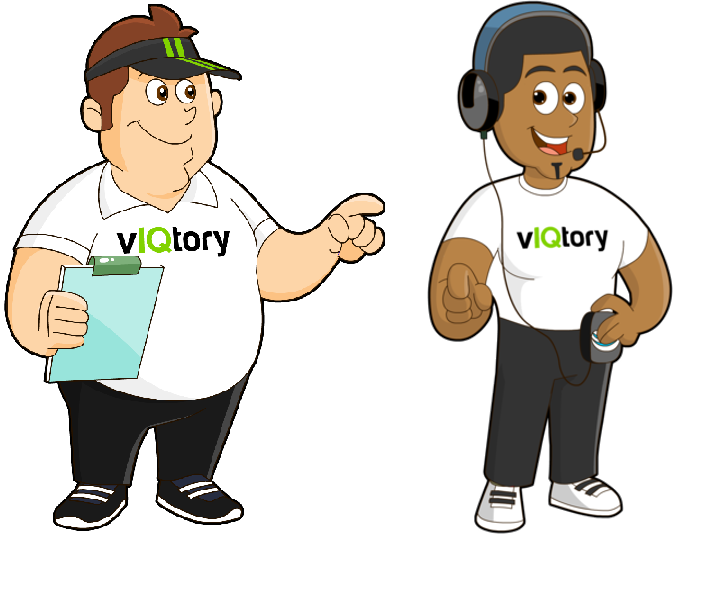 No matter if you’re a player, parent, coach, casual fan or just someone who is looking to learn more about the sport – our platform can help! Our staff is made up of former players, current coaches and football analysts. These different views of game help ensure that we cover all ends of the spectrum, in regards to learning football. Choose one of the many options above to ensure you’re getting the most out of your Friday’s, Saturday’s and Sunday’s! Our goal and mission is to ensure every person can understand and engage with the game that we love, football! Comments? Leave an answer below!